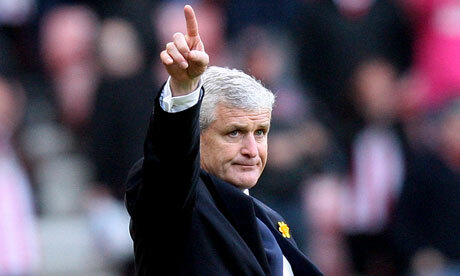 Stoke City are set to announce former Queens Park Rangers boss Mark Hughes as their new manager in the coming days. It is thought talks have progressed well with the former Manchester United striker, and he has emerged as the clubs number 1 choice to replace Tony Pulis who resigned from the position after talks with owner Peter Coates last week. With the Potters board telling Pulis the club were looking ‘to take the club in a different direction’ it has fallen upon Hughes to help guide the club back up the Premier League table, after flirting precariously with relegation last season. Names such as Martin O’Neil and Wigan manager Roberto Martinez had been heavily linked with the job recently, along with outgoing veteran midfielder Phil Neville of Everton. Hughes has Premier League experience after managing Blackburn Rovers for four years, Manchester City for 18 months, Fulham for a year, and most recently Queens Park Rangers where he lasted only 11 months before getting the sack in November. We can expect confirmation of his appointment before the weekend, with the former Wales manager looking to get in amongst his new role at the earliest opportunity to evaluate his squad for next season.